Today wee are throwing it back to 7 years ago, almost to the day. This picture was taken on June 13, 2010! 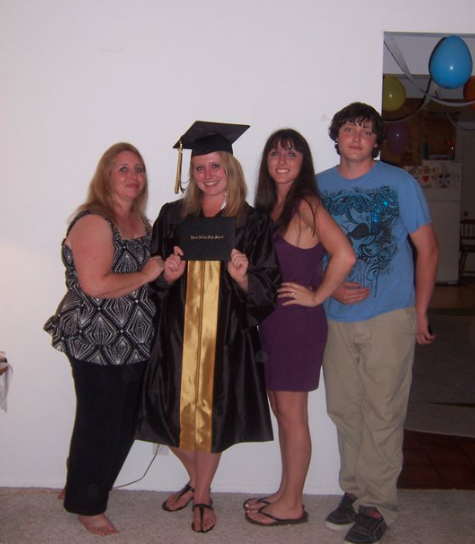 This was my little sister Laura’s High School Graduation. I always joke that this picture looks like it’s done in order of height, but my sister Laura is actually slightly taller than I am she is just randomly bending her knees here lol. This was during my dark hair and bangs phase that I mentioned in my hair story, I actually loved this look, and it was the most consistent hairstyle I’ve ever had. This is also back in my super workout days, that I’m desperately trying to get back into hahaha. I was living near Redding California at the time, and my family had moved back from Costa Rica near Palm Springs California, so I was really excited to fly down and spend some time with them. This was also the first time that we had all the kids together for a long time as our other brother and drove down from Sacramento. I thought it was funny that this picture popped up in my time hop because it doesn’t seem that long ago, but now Laura has two kids, and is about to be married! As a kid I hated when people would say “enjoy cause the years just fly by” but now as I’m a bit older 🙂 I 100% see what they were talking about.